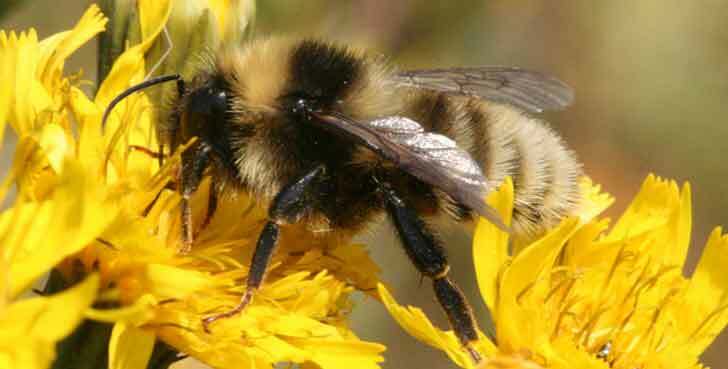 The short-haired bumblebee has been absent from the UK countryside since the 1980’s. During the six decades before its disappearance, the insect’s population plummeted due to the loss of wildflower-rich grasslands. It was declared officially extinct in 2000. Now, thanks to the efforts of Natural England, The Royal Society for the Protection of Birds (RSPB), Hymettus, the Bumblebee Conservation Trust, and the Short-Haired Bumblebee Project, the short-haired bumblebee has been reintroduced into the English countryside from Sweden. Short-haired queen bees were brought to the RSPB Dungeness site in Kent from Sweden, and worker bees have been spotted in the area for the first time this season. Before introducing the bees, the habitat had to be made suitable for foraging and for the queens to lay eggs. The first generation of queens had a difficult time with cold and wet conditions last year, but reinforcements from Sweden helped to strengthen the colony. The group plans to release more queens at Dungeness and work with farmers to create meadows with wildflowers for the pollinators. Other rare bees have been spotted in the reserve as well, including the moss carder bee, brown-banded carder bee, and red-shanked carder bee. As the ecosystems begin to revert to their wild states, the insects are buzzing back to their original homes. The short-haired bumblebee has been absent from the UK countryside since the 1980's. During the six decades before its disappearance, the insect's population plummeted due to the loss of wildflower-rich grasslands. It was declared officially extinct in 2000. Now, thanks to the efforts of Natural England, The Royal Society for the Protection of Birds (RSPB), Hymettus, the Bumblebee Conservation Trust, and the Short-Haired Bumblebee Project, the short-haired bumblebee has been reintroduced into the English countryside from Sweden.